Photo (2) - U.P. CA-1 caboose first kitbash finished. I'll be replacing the ladder/railing and brakewheel when I get my etch artwork finished, and possibly mill the underbody like the one in-progress. Z-scale couplers will be replaced with True Scale couplers too. I'll be glazing the windows too as soon as my train buddy Greg gets his LASER cutter up and running. However, this is the car I'd have a hard time selling...."most valued" for sure! [ Guests cannot view attachments ] [ Guests cannot view attachments ] [ Guests cannot view attachments ] I have not one, but two "most valued" cars, and treasure them equally because of the circumstances attached to them. The second is a Santa Fe homebuilt plow, scratchbuilt by an equally good friend, David Haines of Wichita, Kansas. The plow arrived some months after David's untimely passing, with a message that he "would have liked me to have it". These two models are priceless, as were the friendships of these two very talented men. This is hotter than a scotch bonnet on the surface of the sun! Welcome to Ontario... we've got a tax for that. Great tribute and very nice equipment. David Haines was my idol on that Raton Pass layout from the very start when I saw it in MR. If I wasn't picking up on my Conditionaire, one of the alternates I was considering was a 50' flatcar I got from Verne Niner, with a pipe load. Very special to me, as is all the stuff I picked up from his N layout, before and after his passing, as he sold a lot of his N stuff when he went to On30. In fact, if you look at that Conditionaire shot, on the 'mobile home' on the hill in the back, is the retirement home of Verne's "N Scale Norm" character of the Atlas forum threads. He was given to me by Verne, he's sitting on the porch, along with Sue, the dog, and the cat. That layout scene of yours at Devore is equally impressive. Bryan these are fantastic! Do you know the story behind the third car you posted? I never seen a waffle box like it. Daniel, thank you. The 3rd car was one of a couple of varieties the NP built with waffle sides at their Brainerd, MN shops. They, like the GN, CB&Q, the NYC and I'm sure others, utilized OEM parts from Pullman, Stanray, Youngstown etc., added to homebuilt frames and side construction. This was done likely to save money, get small orders of purpose built cars in less time than the major car builders could supply and also keep communities employed. NP #5300-5699 a 400 car order was built starting in 1966 by the NP at Brainerd. If you note the SP car to the left of the NP car, you'll understand why many of the NP's cars of this period didn't survive all that long into the BN era. They were built to Plate B specs. and lacked the cubic capacity of many cars built shortly after with the advent of the Per Diem and Railbox fleet of boxcars. Just to show that there was paint applied...several years ago. Again, both of these cars are in line to be re-painted in a more as built color. Sorry for the crappy cell phone flash photo, but I didn't want to handle them by removing them from their dust free nest. Here's my half of Josh's "bestie locket". It's my winner. Although I have a few cars that are very special to me, all generally because they came from my friends. Wazzou and Bnsfdash8: Thank you. No wonder I've never seen one! Unittrain: Yes, that gon was Norfolk Southern - the original shortline. It eventual became part of the modern NS, which took the name. 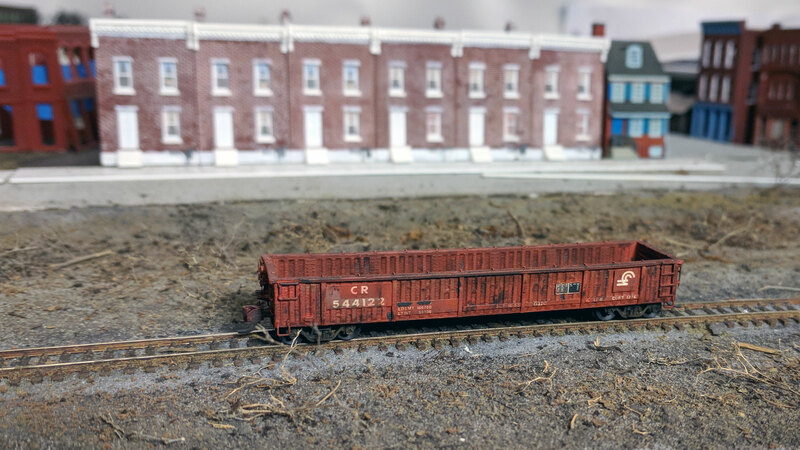 Freight Train: I have one of the Monon cars, now retired, but still serviceable. Randgust: The NP had a series of those Conditionaire cars, bought specifically for potato service. They seem to have worked well enough, but, as you said, were never repeated. The biggest problem they had was that the potato shippers already had conveyor system for loading reefers through the door, and didn't want to invest in all-new loading equipment. In fact, ice reefers remained in service through the 70s, as ventilated insulated boxcars, for potatoes, even though icing ended in the early 70s. Of course, the BN didn't like to waste anything, so they also hauled wheat in the same reefers. Remove the bunkers, plug the drains, load through the hatches, unload through the doors. The reefer doors didn't even need grain doors, but most could only carry about 40 tons, so elevators didn't like them, even with a discount on shipping rates. Covered hoppers were still in short supply then. I don't actually have a favorite car, although if I had to name one, it would be my Nn3, ex-000, tankcar. That thing has been built so many times it's surprising that it still exists. Lone Star 000, fitted with wood body bolsters and Atlas trucks/Rapido couplers, detrucked and turned into a diesel storage tank for engine service, returned to standard gauge service, again turned into a storage tank, with a different base, and now in narrow gauge revenue service. It's the second from the left, MORX 61. Thanks Doug! They run real well too- a real nice design from Atlas!